A dog and two Maasai children chase us down the bank as we push off and drift away. Suddenly we are waterborne, effortlessly gliding down the shallow river as the world floats by. Baboons, guinea fowl and that strange breed of stripy donkeys which are not zebras, observe us unfazed from the bank. The water has the colour and consistency of chocolate milk. It is perfectly clean, our guide Asailepu Ole Setei insists, but it’s easy to see why one might be inclined to think otherwise. We have four inner tubes and two canoes between us. The inner tubes offer a wet but relaxing journey: sit in, lay back and languidly allow the current to drag you downstream. The canoes instead offer a bit more in the way of movement and it can be fun to paddle upstream for a bit, before giving up and letting oneself be dragged back to the rest of the floating group. We are drifting down what is locally and aptly called the “Ewaso Ngiru” (the Brown River) in Shompole, a ten thousand hectare conservancy to the south west of Kenya. The river starts at the Mau escarpment and ends at Lake Natron, on the Tanzanian border, an hour’s drive away. We have been staying at an eco-camp called Loisiijo Lodge which is run by the local Maasai community. The lodge takes its name from a large Tamarind tree that is the focal point of the space and a place where warriors used to come, camp out and spend time slaughtering cows, eating meat and becoming, in the words of Ole Setei: “strong and resistant to diseases”. It takes roughly four hours with an off road car to get to Shompole from Nairobi. Until Ongata Rongai the going can be pretty slow, but once into the Ngong Hills, traffic thins out and the only thing to look out for on the road are the many potholes and the occasional herd of cows and goats. To get to Shompole you must first drive to the scenic soda pans by lake Magadi. Loisiijo Lodge has been running for about ten years. The place was first “discovered” in the 1970s by travellers who would come and camp underneath the tamarind tree. The idea to transform the space into a lodge came with the support of the African Conservation Centre (ACC) and with their help and money from the government, the community came together and built eco-cabins, a dining area and a lodge overlooking the river from which at night it is possible to hear the sounds of the wildlife as they come and quench their thirst. The lodge is run on solar power and the water from the taps is all filtered straight from the river. According to Ole Setei, over the years the benefits of the lodge have far outweighed any potential problems that could have resulted from a large influx of tourists. From the point of view of conservation, he explains, the results are plain for all to see: fifteen years ago there were only five lions in the area and the number is now closer to fifty. The same goes for giraffes, zebras and wildebeest, who’s populations have considerably expanded since the conservancy was founded. 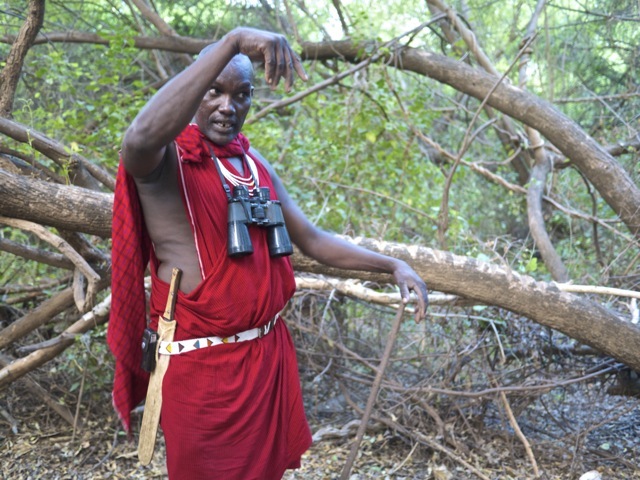 The Shompole conservancy is run by a committee of twelve people that are elected every five years by the community. Promotion and visitor relations are managed out of an office in Nairobi. The location is amazingly peaceful and visitors have the opportunity to go on many excursions, bird walks, cultural visits, game drives and of course, inner-tubing down the river. We float by a couple Maasai men who are relaxing under the shade of the ficus trees that line its banks like an avenue. They glance up sleepily but do not seem particularly surprised, we are neither the first nor the last assorted group of visitors to float down this muddy river. As we glide round the final bend, we can see a welcome committee of sorts ready to pull us out of the mud. Loisiijo Lodge is simply a must see location for Kenyan tourists. Sadly a brief glance through the visitor’s book, reveals that although many visitors do come from Nairobi, Kenyan names are few and far between. The lodge is an example of a place which is affordable to middle income families and that should not be overlooked. As travel advisories for foreigners increase, it is down to Kenyans to help preserve the amazing wealth of destinations that the country has to offer.